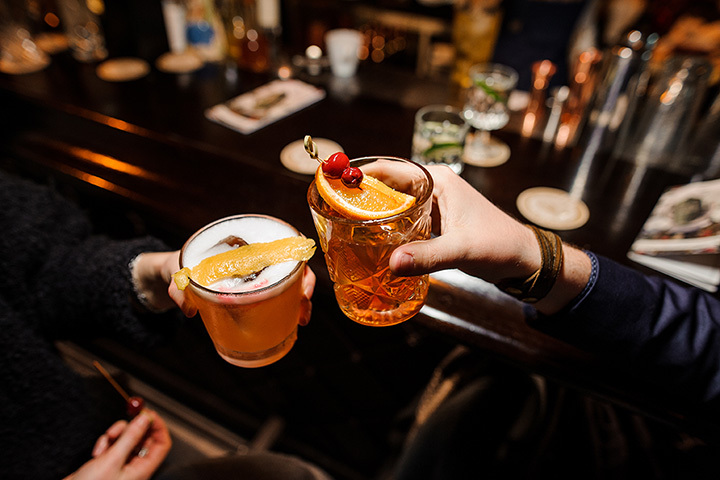 Whether you’re looking for a classy place for a date, to relax, or to grab a bite to eat before heading out for the night, Idaho’s cocktail bars won’t disappoint. Selections run the gamut from a homier atmosphere with big TVs and impressive food menus to modern, chic spots where you should dress to impress. Without further ado, check out our top 10 choices for cocktail bars in Idaho. Juniper is one of the most recognizable and delicious cocktail bars in Boise, Idaho. Unlike straight-up cocktail bars, Juniper pairs their fantastic selection of beverages with an unparalleled menu. Stop by this “Best of Boise” winner any night for a good time (and take advantage of their happy house from 10 p.m. until one hour before closing). Craft Lounge “aims to cultivate a drinking culture in the small town of Nampa, Idaho.” The cocktails are reasonably priced and include classics as well as home-made concoctions. Our favorite? The Tongue and Cheek, made with Smith and Cross rum, lime, dry curacao, orgeat and Campari. The White Water Saloon in Meridian, Idaho is the real deal. Open from 10 a.m. to 2 a.m. every day, White Water is a cocktail bar/entertainment power house. They have monthly events as well as regular bingo and karaoke. The Clydesdale Bar and Lounge is “committed to satisfying our guests with great food, fun, and service.” Stop in for happy hour every day from 4 p.m. to 7 p.m.. Clydesdale offers beers on tap, cocktails, food, and lots of entertainment. Check their website for an updated event list. The Duchin Lounge, inside of the Sun Valley Mall, is the perfect respite from the busy shopping area. The lounge has a wonderful, comfortable atmosphere and serves beer, wine, and cocktails. Hungry and don’t want to brave the food court? Choose from a variety of menu options, too. Whiskey Jacques in Ketchum, Idaho styles itself as Ketchum’s “premier music venue and sports bar,” but that description doesn’t quite do it justice. This trendy spot has eight big screen TVs and frequent live music performances. Enjoy the scenery in this historic pub with a glass of something tasty and good company. Nectar has been serving up delicious cocktails and food for over a decade. Unlike other cocktail bars, Nectar is a spot to come in and enjoy before going out for the rest of the party. They’re open Monday through Saturday from 4 p.m. until 10 p.m. All cocktails are seasonal. 315 Martinis and Tapas’s mixologist is focused on making seasonal cocktails, as well as the classics. You’ll find your Manhattan’s and Old Fashioned’s, in addition to drinks like Dueling Banjos (Hendrick’s Gin, Campari, and St. Germain). They have a full menu, including tapas and entrees to enjoy, too. Up North Distillery is a “craft distillery and cocktail bar situated in the beautiful Post falls / Coeur d’Alene area.” Their craft cocktails have won multiple awards, including from the 2018 American Distilling Institute Competition, American Craft Spirits Association Competition, and 2017 Denver International Spirits Competition. Can’t choose? Try the Twisted Old Fashioned: made with aged honey spirits, sugar cube, bitters, lime, cherry, orange, and club. Bumpin Bernie’s is, in a word, bumpin. For almost a decade, they’ve been providing Twin Falls with a go-to spot for nightlife entertainment. This hookah lounge and cocktail bar keeps things fresh with Friday night specials, live music, and events. Check their website or Facebook for details.